Shanghai, Oct 8 : World No. 1 Rafael Nadal looks forward the Shanghai Masters tennis tournament, seeking to win a record sixth ATP Tour Masters 1000 title of the season. The 27-year-old currently leads the way with 26 Masters crowns, his closest challenger being Swiss mogul Roger Federer with 21. No male tennis player has won six Masters titles in a season. "I consider the ATP World Tour Masters 1000s one of the toughest tournaments to play because if you are not playing well from the beginning, it is very difficult to be through," Nadal was quoted as saying by Xinhua Tuesday. "From the first round you have fantastic opponents in front of you. Sometimes in Grand Slams you can be a little bit luckier and you can have the draw a little bit more open. In Masters 1000, that's very difficult." The Spaniard has compiled one of the best seasons of his career since returning to the ATP World Tour in February, recording a 65-4 match record and winning 10 titles. He returned to No. 1 spot for the first time since July 2011 when he reached the China Open final last week in Beijing. After triumphing in Indian Wells in March, Nadal became the first player to win four Masters titles in a row, capturing titles at Madrid, Rome, Montreal and Cincinnati. 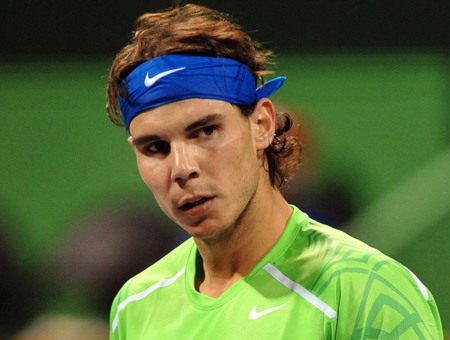 "I thought that I would never have the chance to be back there," confessed Nadal.